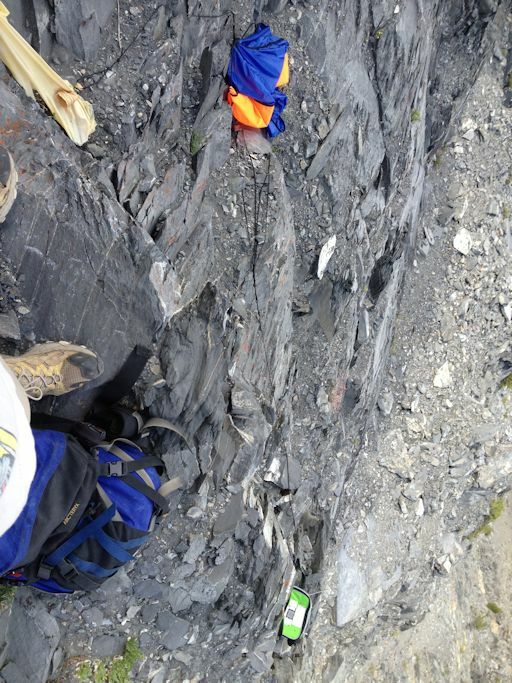 As shown above, the payload was dangling from a shear cliff face more than 1400 feet above the foot of the Nevahbe Ridge. Super-climber Michael White, a member of the Earth to Sky Calculus student group that launched the balloon, was able to reach the landing site and snag the payload from the safety of a small ledge just above the parachute. The shoe in the photo belongs to Michael. This balloon was launched at the peak of a record-setting heat wave in the southwestern USA, bringing temperatures as high as 128 F to desert areas around the launch site. The goal of the curiosity-driven flight was to discover whether the heat wave extended all the up to the Edge of Space. To help answer the question, the balloon’s payload was outfitted with two HD video cameras, a pair of GPS trackers, a GPS altimeter, a cryogenic thermometer and an ozone sensor.